Great start sheet that lists various ways of communicating with databases, other tools, services and languages. Adobe ColdFusion is a rapid application development toolkit that is written in Java and runs on top of the JVM. Its core philosophies are: make things easy, and provide RAD without restricting developers. 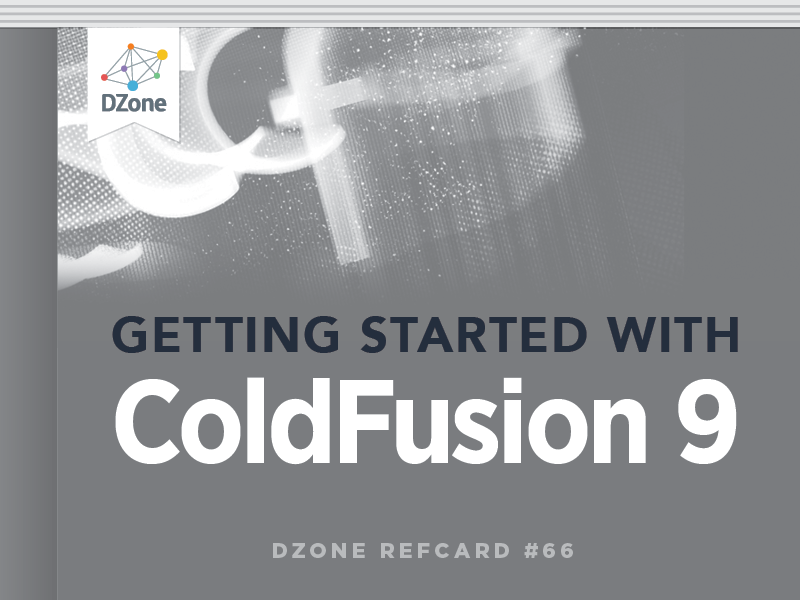 This Refcard will take you through getting started with ColdFusion 9. It will take you through the various pieces and languages that comprise ColdFusion. It will also list various ways of communicating with databases, other tools, services, and languages. This Refcard is aimed at programmers in other languages that are considering taking a look at ColdFusion. This installs ColdFusion as a stand-alone server. Despite the fact that ColdFusion runs on a J2EE server the stand-alone version bundles the J2EE server. This makes the J2EE server inaccessible, but the whole package easier to administer for newcomers to J2EE. This is the easiest way to get started with ColdFusion. This will install ColdFusion as a single instance running on JRun. This will allow you to install multiple ColdFusion servers on your box if you wish. Additionally, JRun is a J2EE server capable of running other EAR or WAR files. J2EE server of your choice. The server component of ColdFusion consists of an executable server that can run as a service or daemon on your OS. This server component handles processing ColdFusion requests but also stores a lot of configuration for your applications centrally. This allows you to configure your datasources in one place, and then just refer to them by alias in your code. You can also set things like mail server defaults, central code collections, path mappings, third party licenses, etc. Most of what you can set here can be overridden at the application level, but by setting it here, you can avoid having to store that information in your applications. CFML is a tag-based language that prefixes all ColdFusion specific calls with “cf.” Some developers use CFML to write their entire application. Others however, use CFML for front end code, display code where CFML mixes well with HTML and use scripting for their business logic. Most examples of code in this Refcard will be given in CFML except where showing the script version is particularly important, but they all have CFscript analogues. <cfset newTest = test + test />. <cfset stringLen = len(test) />. There are two classes of variables by type in ColdFusion: Simple and Complex. Simple variables are variables that are limited to one unstructured value. They include: String, Numeric, Boolean, or DateTime. Complex variables are those that either contain structured elements or binary data. They include: structs, arrays, queries, XML, images, and objects. All variables in ColdFusion live in a scope. The scopes are just collections of variables that share similar sources or audiences. They are all ColdFusion struct variables. These scopes only exist for the life of one page. They can only be accessed by calls made in that page. CGI Contains variables created by the Web server. It gives information like requesting host, ip address, and complete URI information. Form These are values passed by a form Post to a page. Request Prefixing variables with “request” creates this scope. It exists across all calls, functions, or custom tags, contained within one single request. URL These are values passed by a form GET to a page or appended as a query parameter on the tail end of URL request. Variables This is the default scope for variables in a request that are not in another scope. It is only accessible within the main flow of the request, and not directly in any other call like a custom tag or object call. The following scopes exists for more than the life of one request. They are often the place for storing variables which are used across the life of a user’s session or an application’s life. Application Variables persist across the life of an application. They are accessible by any request that has the same application name. Client Variables persist across the life of a user’s session in a particular application. They are accessible from any call for a particular user in a particular application. Unlike every other scope, its values can be stored on disk or database. Cookie Variables persist either across the life of the user’s browser session, or according to a date that is specified when set. Server Variables persist across the life of the server. They are accessible by any call anywhere on the server. Also contains information about the server instance of ColdFusion, like version, OS, etc. Session Variables persist across the life of a user’s session in a particular application. They are accessible from any call for a particular user in a particular application. Unlike the Client scope, the values are stored in server memory. Arguments Variables that are passed in as arguments to a UDF. Values set here accessible only to the currently running call of the UDF and are therefore thread-safe. This In CFC the variables scope is accessible externally and to any of the internal methods. It persists across the life of the instance of the CFC. Not thread-safe. Local Private scope for a UDF. Values set here accessible only to the currently running call of the UDF and are therefore thread-safe. Created by prefixing variables with “local” or by setting with “var” keyword. Variables In CFC the variables scope is accessible internally to the any of the methods and persists across the life of the instance of the CFC. Not thread-safe. The following scopes are used custom tags. Attributes Variables that are passed into a custom tag. Values set here accessible only to the currently running call of the custom tag and are therefore thread-safe. Caller An alias for the variables scope of the calling page of a custom tag. Variables The default scope for variables in a custom tag. Values here are only accessible in the custom tag itself. Session, Application, Server, and Request scopes will not yield their values without an explicit reference to them. Here is a traditional “Hello World” page. It takes a date that is passed in and formats it. If no date is passed in it sets the date to Now(). As of ColdFusion 9, properties yield implicit getters and setters. onApplicationEnd Is not triggered when the application times outs or the server shuts down gracefully. onApplicationStart Is triggered the first time an application is called. You can use this function to initialize application variables. onError Is triggered whenever an uncaught exception is raised anywhere in the application. onMissingTemplate Triggered whenever a request is made for a cfm or cfc that doesn’t exist in the application. Can be used to simulate virtual files. onRequest Replaces a request. If you use this method, you have to explicitly include the intended page or cfc. Useful for wrapping layout and formatting features around an application. onRequestEnd Triggered by the end of a request. onRequestStart Triggered by the start of a request. onSessionEnd Triggered the first time a particular user calls a URL in the application. Useful for setting session scoped variables. onSessionStart Triggered when user session ends, usually because the session timed out. ColdFusion was originally designed to be a language to bridge backend databases to Web pages. As such, handing record sets from database is a key part to using ColdFusion. ColdFusion has built in support for many flavors of database including: Microsoft SQL, MySQL, Oracle, Derby, DB, and Postegres. However ColdFusion can interact with any RDBMS with a JDBC driver. In order to work with a particular database in ColdFusion, you must first create a datasource. A datasource is the collection of settings you use to communicate with a database, such as database type, sever, port, tablespace, or database, username and password. You collect all of these settings and give them a meaningful name. ColdFusion then allows you to refer to just the datasource name when connecting to the database. The server will handle maintaining connections, closing them, persisting them. In short ColdFusion abstracts database connections into datasources. tags allow you to pass a query attribute in for easy iteration. In order to help looping and paging, queries have a few special properties. ColumnList A comma delimited list of columns in the query. CurrentRow The current row that is being accessed in the context of a cfoutput or cfloop call. Additionally ColdFusion allows you to do parameterized queries using the cfqueryparam tag. Stored procedures can also be called from ColdFusion using the <cfstoredproc> tag. As of ColdFusion 9, Hibernate is baked into ColdFusion and allows CFCs to be mapped to database tables. This.datasource The name of the datasource to use for ORM CFCs. This.ormenabled A Boolean which turns on ORM. CFCs support Hibernate relationships, and allow you to setup one-to-one, one-to-many, many-to-one, and many-to-many relationships. CFCs also support more advanced features of Hibernate including: Join Mapping, Collection Mapping, Inheritance Mapping, and Embedded Mapping. In additional to all of the features that ColdFusion enables through CFCs, it also can take hbm.xml files to model your objects. Also ColdFusion allows for making queries against the object model using HQL, Hibernate’s SQL-like query language. The <cfoutput> tag handles basic output of variables. In addition to being able to output variables to HTML templates, ColdFusion has built in a number of UI controls for handling of complex data. ColdFusion can communicate with a large number of servers, products and languages using built-in tags. <cfset pwd = CreateObject(“.Net”, “System.IO.Directory”). In addition, the object tools allow you to interface COM and CORBA. A large part of current Web development is programming to and against service APIs. ColdFusion has a number of built in tools to consume and produce services using either SOAP or REST. ColdFusion is able to consume SOAP Web services, by using either the <cfinvoke> or <cfobject> tags. You simply point them at the WDSL of the service. REST Web services can be consumed by using <cfhttp>. REST: get, put, post, delete. However this might not strike some people as RESTful enough. Instead you should write an intermediate page between the CFC and the caller that uses the HTTP verb to determine the method to take. This can be done either by introspecting the CGI scope or using the GetHTTPHeaders() function. plain Just the output, assuming it is a simple variable type. Finally, any remotely exposed service is also available as a Flash Remoting or AMF service. This means that it can be consumed in Adobe Flex using the RemoteObject interface. This Getting Started volume starts with Web and Internet fundamentals and database concepts and design, and then progresses to topics including creating data-driven pages, building complete applications, implementing security mechanisms, integrating with e-mail, building reusable functions and components, generating datadriven reports and graphs, building Ajax-powered user interfaces, and much more.